Right before I left for my trip for work I signed up for a Stephen West book signing at my local yarn shop, Fibre Space for his new book Westknits Bestknits 2. It was partially why I knit his Brio-Garter Hat, just because I knew I’d meet him. Also one of my early projects that had cables and short rows and I was super proud of in the beginning was his Helm hat pattern (one for my husband and one for myself). It’s still one of my favorites. And I must say, he’s just delightful in person. Also I did not wear my Royally Striped cardigan to meet him but he did compliment me on my color choices for my Comfort Fade Cardigan. He is as animated and colorful as his designs, which is one of the reasons I really like his patterns. 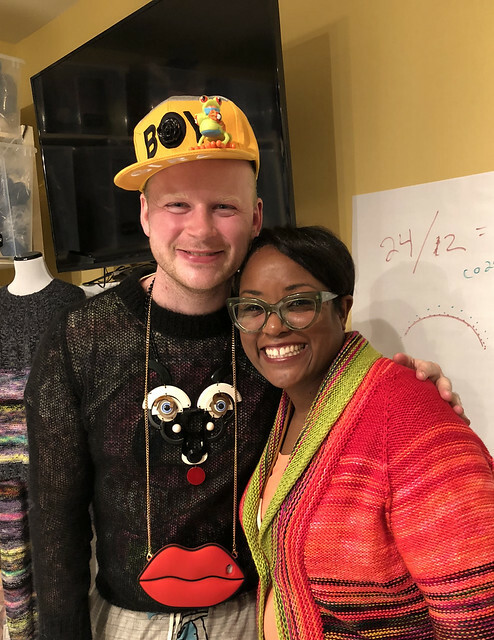 He doesn’t stick to a lot of the knitting norms and encourages you to make it your own and use his patterns as just a foundation to a creative piece. His explanations of his design process were really interesting, I love hearing how designers work. 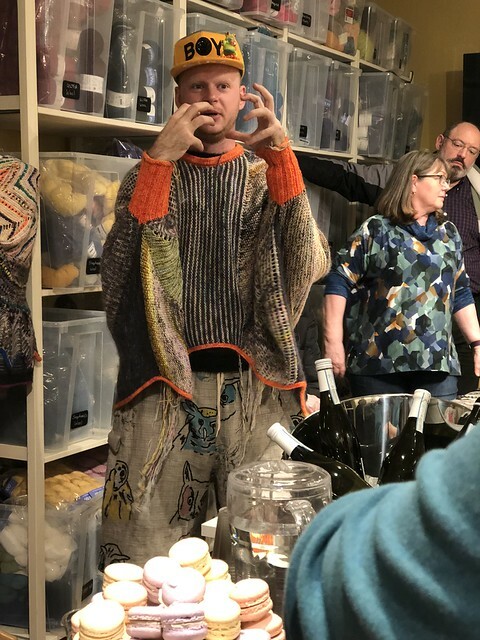 And he said a lot of the reason why he’s doing fading and marbling in his knitting is because he knows a lot of knitters buy 1 or 2 random skeins of yarn and this is an easy way to blend them all together instead of having to have a sweater quantity of a single color. And he said one thing I really loved, ‘don’t knit it if you don’t love it, do what you want to do.’ That was really my mantra last year, I only made stuff I really wanted to make when I wanted to make it. And that’s how you end up knitting 27 sweaters in a year. His Kanagarullover (you may have seen it on Instagram)!! He brought this sample with him and it is so good and it has a huge kangaroo pocket on the front that I can totally see Jellybean trying to snuggle inside of when I wear it. I told him the kinds of yarn in my stash I was thinking of using and he suggested I add in some non-superwash yarns so it wasn’t as heavy so I used my gift card to pick up some creamy white Woolfolk Tov DK. I surprised myself with a purchase of all white yarn but I figured I’ve got a ton of color and want to mix it up and tone it down a bit. I cannot wait to get started on this one! I have a feeling it will be on my needles sooner rather than later. Oh you lucky girl! I would love to have gone to meet Mr. West with you. I love his personality. 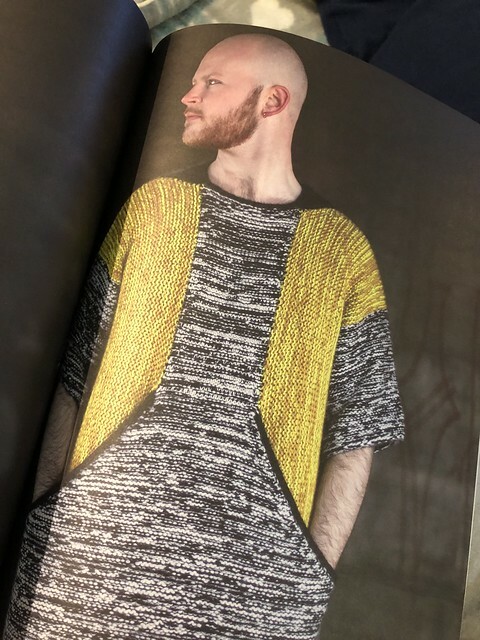 I admire how quickly you can produce a sweater! You’re really fast. Oh I’m so jealous:) He is so inventive and bold with his color choices and designs. I love that sweater and look forward to seeing yours! My brain may explode with all the possible color combos I could make! Isn’t that refreshing?! Sometimes I have to calm down and just say, okay if I mess up I can just do it again. It’s okay. 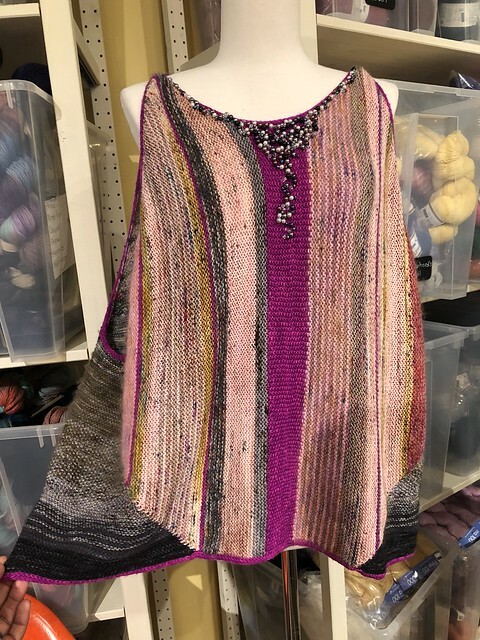 One more thing….I never thought of superwash yarns as being heavy, but it makes sense since they are coated with synthetics as part of the process of making them washable. Same. But my royally striped is heavy and it’s pretty much all superwash, so he’s got a point. I actually realized I’ve got a ton of a fun bamboo wool blend that I may try to make with it. Loved the Kanagarullover! He’s very creative and his use of color resonates with yours. I’m glad with your meeting! I love his outfit. It goes really nicely with yours, in fact! Stephen West was the keynote speaker at my local-ish fibre fest this year-I went to his lecture expecting him to be bonkers, but really, he’s incredibly passionate, supportive, sweet, and most of all, doing what he loves. 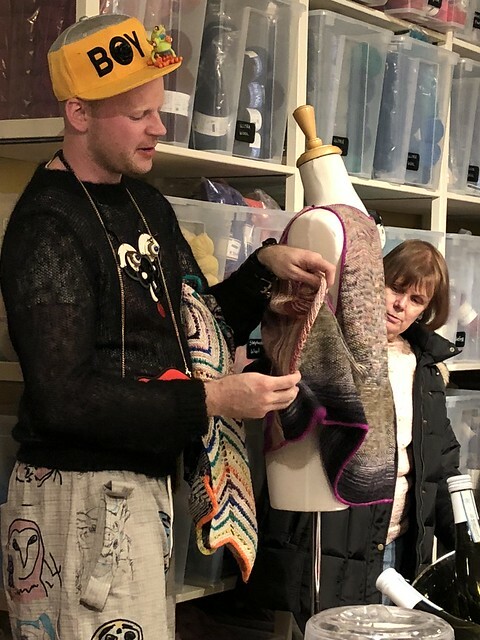 I didn’t take any of his classes because that type of use of colour is never going to be in my comfort zone, but I love seeing what you do with it, and can’t wait to see how your sweater turns out! He really is a nice guy and you should totally take one of his classes and just get a little out of your comfort zone. You might find that you fall in love with his technique and can apply it to your preferred color palette. This was so interesting. But what totally blew me away was your 27 sweaters! You were so cute in your pic with him. I love what he said because it’s so true…I went crazy at one period and have all of these single skeins. I don’t mind so much the sock yarn, but the worsted and bulky bug me. I always have random worsted skeins but never sock. But I’m also finding my love for dk weight is growing.